Is That A Podcast Studio In Your Pocket? The Belkin GoStudio is a portable podcasting studio designed to let you capture high-quality audio recordings on-the-go and then publish directly to iTunes when docked. 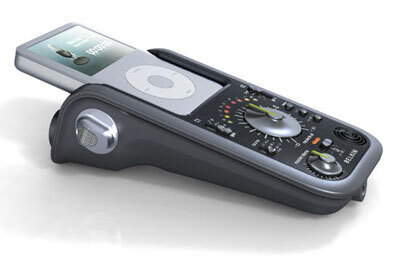 The Belkin GoStudio is expected to be available this summer. wow, that’s a slick looking machine! huge change considering the usual ipod-attachable stuff is quasi unusable for podcasters. Oh god I want this … give it to me now !! When, oh WHEN will people start supporting the new iPod touch and iPhone platform for this sort of thing?? both have more robust processing capabilities, as well as flexible OS platforms on which to build feature-rich application support for the product. Think about it: exploit the iPhone’s processor for real-time MP3 encoding, tap into the WiFi capabilities to stream recordings directly into a LAN, exploit the full screen and open GL 3D rendering capabilities of the device for graphic EQ displays and user interface. Not to mention, SOLID STATE STORAGE. Looks cool, but already niche. lol the reason is because though the ipod touch and iphone have “more robust processing capabilities” not many people are willing to put $250-400 for 8-32gb of memory…and the iphone isnt on enough prividers yet for many people to want to get it…. most peoiple just dont think about jail breaking a phone…. most dont even know that its possible…..